Anterior ankle impingement is most often a sports pathology revealed by pains located at the anterior aspect of the ankle and/or on the instep. Pain worsen by practicing sports and sometimes limit the mobility in dorsal flexion. During sports and particularly ball sports, ankle dorsal flexion movement is sometimes extreme. The talus get closer to the tibia, sometimes with a contact between the two bones. Small intensity injuries happen repeatedly and as a consequence a soft tissues’ inflammation follows (joint capsule and tendons) and/or an abnormal bone growing at the joint’s edge called osteophytes. When the two bones get in contact, the pathology is called bony anterior ankle impingement. When there is no bony contact the impingement may injure the soft tissues, which is called soft tissues anterior impingement. In both cases the joint is micro-traumatized repeatedly, which leads to its wear. This describes the processes ending in a mechanical ankle arthritis. The first step consists in examining the ankle. The surgeon tries to reproduce the pain by pressing the anterior aspect of the ankle in the same time with forcing the dorsal flexion. The impossibility to crouch is sometimes noticed. It corresponds to the loss of dorsal flexion because of a painful anterior contact. X-rays are mandatory, particularly a profil (medio-lateral) view of the ankle. The aspect of the joint is analyzed looking for osteophytes as they are a proof of impingement. 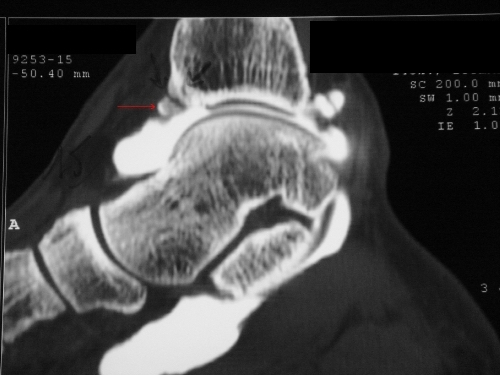 In case of a bony an anterior ankle impingement, an arthro-CT scan is prescribed in order to see the cartilage’s condition inside the joint. For this exam an opaque-to-x-rays liquid is injected in the joint. It will mould the cartilage and make it appear in negative on the CT-scan. This exam is the most precise to study the cartilage. However, radiologists in some countries are reluctant to do it because of the injection they don’t want to perform. They try to replace the arthro-CT by an MRI which is still not as good as arthro-CT in this indication. If an soft tissues impingement is suspected, an arthro-CT won’t help. An MRI is prescribed, which locates the inflammation in the hypertrophied tissues. The less aggressive measure, the most effective, and however the less accepted by patients is to stop practicing sport. 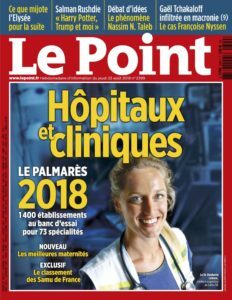 Indeed, it is more difficult to convince a young patient who dedicates several hours a week to his physical activity to reduce it, or even give it up. Cortisone derivatives injections are an essential step with their high anti-inflammatory action. A needle delivers the liquid locally in the joint and in contact with the soft tissues under x-ray control. It may be interesting to take advantage of an arthro-CT to inject the product with the same needle and thus limit the number of aggressive steps. In some cases the injection is rapidly and lastingly efficient. In these cases it is useful to renew it when the symptoms reappear. Sometimes, its effect is limited or even non-existent. The recourse to surgery then becomes legitimate. 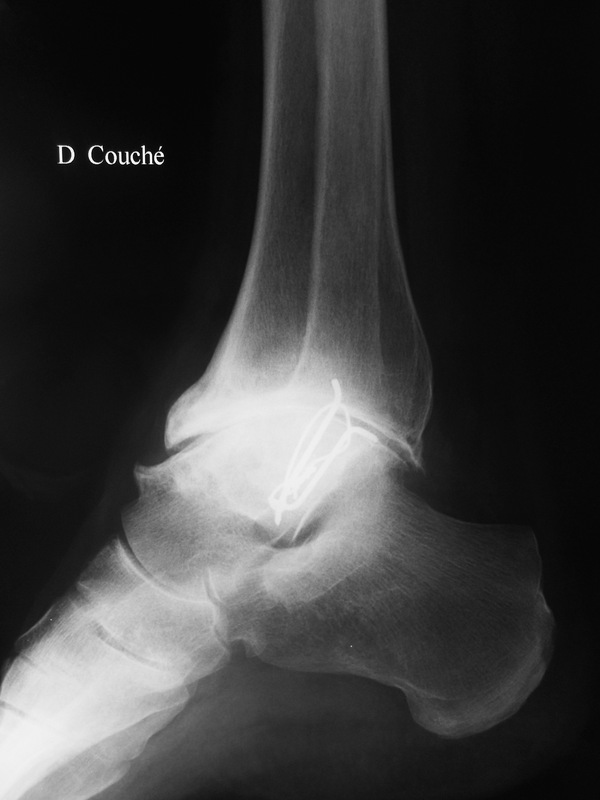 Ankle arthroscopy is considered as a reference in the treatment of anterior ankle impingement. 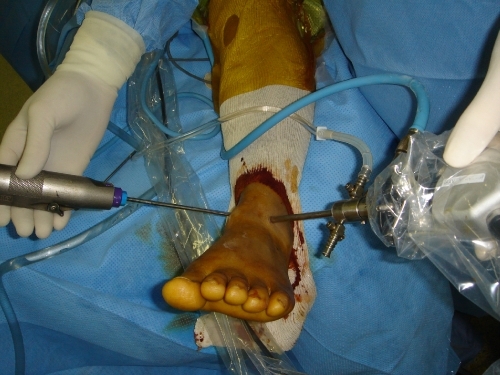 In this procedure a camera and miniaturized instruments are inserted in the joint through small scars. The surgeon keeps control on the procedure and his instruments through a screen showing the camera’s images. Anterior ankle impingement: arthroscopy is performed through two scars, one for inserting a camera and the other for the instruments. In the case of a soft-tissues impingement, the surgeon removes all inflammatory tissues visible on the screen and responsible for the symptoms. For a bony impingement the procedure consists in burring the osteophytes located at the anterior part of the tibia and at the talus neck. No more bone stops the dorsal flexion which improves. More often both gestures are associated in a combined soft-tissues and bony impingement. Arthroscopy ends with a visual analysis of the cartilage “landscape”, which is the best prognosis element. 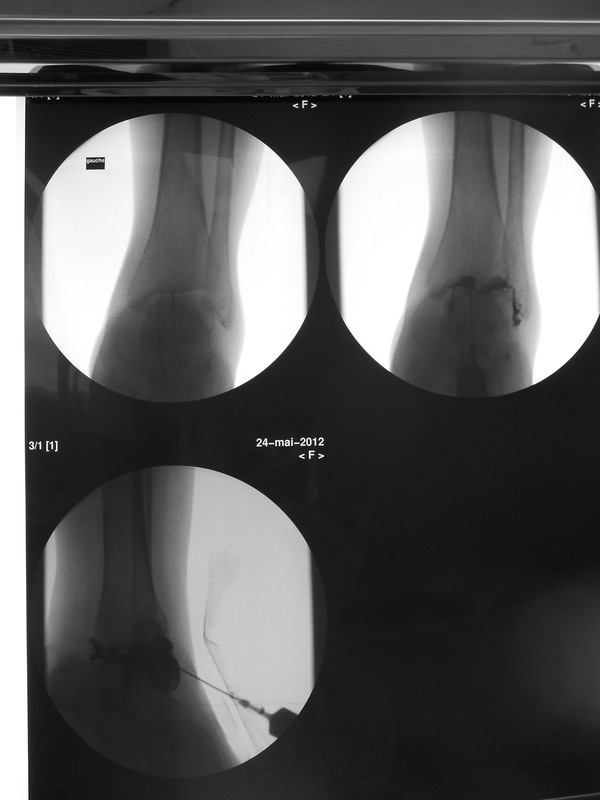 Surgery is performed in an outgoing procedure with the patient returning home the same day after ankle arthroscopy. Weight bearing is allowed immediately with pain as a limit. If painful the use of crutches is a relief. In case of a bony impingement dorsal flexion is recovered right after surgery and maintained with physiotherapy. Improvement in the general use of the joint is usually achieved around one month postoperative.